See What Open Choice Can Do for You! This workshop will examine the history of restorative practices, ground participants within a common language, examine current disciplinary practices and statistics, explore foundational tenets of the model and review restorative practices available for use in the school setting. This workshop will discuss legal responsibilities for schools regarding bullying and harassment, identify specific roles and responsibilities, report on current statistics regarding the number of bullying and harassment incidents in schools grades Pre-K through twelve, identify strategies for preventing incidents of bullying and harassment and discuss the cross-walk between bullying and school culture and climate. This workshop will provide participants with a review of the X and Y axes, define baseline, aim line and trend line data, provide opportunity to practice graphing data and discuss how to utilize data to develop effective student interventions. This workshop will explore possible causes of student misbehavior, identify prevention techniques, examine the cycle of escalating behavior and strategies for breaking the cycle and discuss intervention techniques that do and do not work. This international and interactive training program provides participants with an understanding of mental health disorders, provides information on prevalence rates and age of onset and teaches audience members how to utilize a standard procedure to intervene with students in crisis. The precursor for this workshop is Balanced and Restorative Discipline. Participants will be provided with the agenda for a facilitated conference, acquire the skills necessary to facilitate a restorative conference and have an opportunity to role play running a conference. This workshop will review the history and foundational tenets of the Individuals with Disabilities Education Act and Section 504 of the Rehabilitation Act of 1973, an understanding of PPT and 504 team meetings and a discussion of the roles and responsibilities of all team members. This workshop will define trauma, provide participants with facts regarding prevalence rates, review the latest brain research, explore the impact of trauma on learning, behavior and social development, reveal promising strategies for use in schools and share CT clinical resources. In keeping with recent changes in CT education legislation, parents may now invite paraprofessionals to sit in on PPTs. This workshop with provide paraprofessionals with an understanding of the legal guidelines regarding PPTs and provide guidance regarding their participation in the process. (90 minutes) Minority children enter Connecticut’s juvenile justice system at a higher rate than their white peers and are treated more harshly there. Research shows that these differences aren’t because of how kids behave, but because of the decisions that adults make. Although white students made up 62% of Connecticut’s student population in 2011, only 35.3% of students arrested were white. Black students were 18.6% of the state’s students, but 34.2% of those arrested. The Color of Justice is a brief film examining this problem. The film viewing is followed by discussion of the school to prison pipeline and ways schools are collaborating with other organizations to keep youth out of that system. School districts increasingly are identifying and correcting policies, practices, programs and procedures that perpetuate the achievement gap and institutional racism in all forms. By applying corrective measures, district and school leaders can make a significant impact on student learning and resource allocation. This session will review how an impact assessment tool can help decision makers to mitigate adverse impacts on communities of color when policy, practice, procedure or program options are being considered. 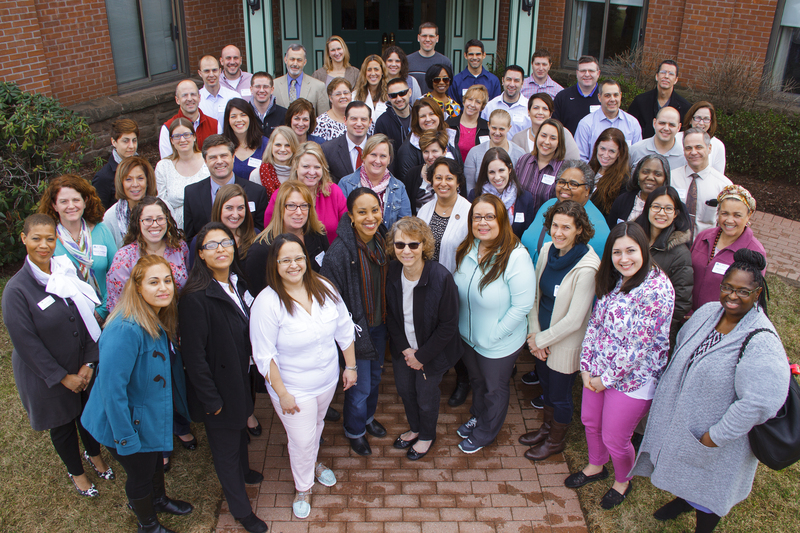 This one hour session provides an overview of the 50+ year history of the Hartford Region Open Choice Program, previously Project Concern, along with the programs and services offered to Open Choice districts and families by the Capitol Region Education Council (CREC) and funding offered by the State of Connecticut to support the program. In addition, there will be a brief overview of the 20 year history of the Sheff v. O’Neill. (90 minutes) Participants will learn more about implicit racial bias, the attitudes and stereotypes that affect our understanding, decisions and actions in an unconscious manner. The presentation, readings and discussion will focus on where and how implicit bias surfaces within education settings, the impact on student outcomes and strategies to counteract it. 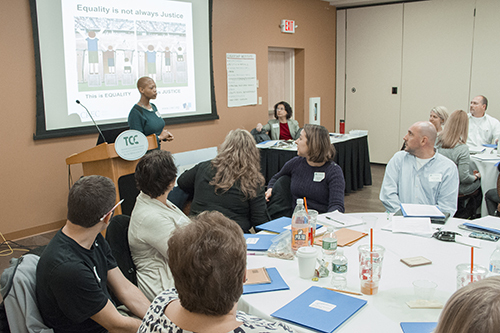 This two-day retreat is designed to create a learning community that develops the trust, awareness and skills needed to address the personal attitudes, practices and policies that impact the racial/ethnic achievement gap in schools. The retreat dialogues are followed by six coaching sessions to assist with implementation of generated action ideas. Participants include school leaders, administrators and central office personnel. (Retreat days need not be back to back, but should take place within 3 – 4 weeks of each other). These six two-hour dialogue sessions aim to build a unified group of diverse parents, teachers, administrators and other school staff who understand both the challenges and benefits of a diverse school. The first two dialogues enable participants to develop trust and begin understanding each other’s experiences. Building on that trust, people in subsequent sessions explore different racial/ethnic experiences and viewpoints, examine school culture and policies, identify, then begin working toward desired changes. The goals are to create personal and group action steps that address racial and ethnic barriers to student achievement and parental involvement in schools, and to develop an environment where racial and ethnic issues can continue to be discussed openly and productively. 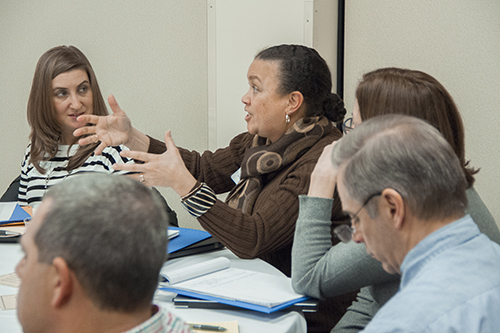 Designed to understand students’ experiences and perceptions regarding race/ethnicity, and how these impact their education, these three three-hour dialogue sessions (length/frequency may be tailored) include participation by students, staff and administrators and include discussion of racial barriers to student achievement. (2 – 4 hours) This workshop is an orientation to a process that engages diverse staff, parents, and students in facilitated dialogue and problem solving. Since 2003, more than 8,000 stakeholders have participated in 430 Study Circles in Montgomery County, MD, to help address the persistent gap between African-American and Latino students and their Asian and White peers. Actions and outcomes from these dialogues are well-documented. Open Choice now offers this engagement process locally. (90 minutes) This interactive session helps participants delve deeper into analyzing racism and furthers one’s understanding of how to use a structural racism lens. Many times, actions are focused on changing individual beliefs without looking at the cultural practices and institutional policies that contribute to racial disparities within a school. Through this interactive session, participants will have the opportunity to break down the issue of racism at a structural level so that the group can create and consider realistic action ideas for change.